A great instructor. Cares about his students succeeding. Capstone secondary math methods course and supervising the math content of pre-service secondary teacher’s math placements. A summer course for in-service teachers, with content classes in the morning, and pedagogy classes in the afternoon. Content classes focused on cryptography. Co-taught with a very large faculty. A standard two lecture one recitation college algebra course. A course for pre-service teachers in two parts. Part 1 focuses on developing techniques for solving and teaching word problems and modeling problems at the secondary level. Part 2 is an introductory course in mathematical biology in which the pre-service teachers apply the skills learned in part 1 as students so that they can experience this type of instruction. A hybrid course combining traditional lecture and recitation with applied problems and once a week spreadsheet studio labs. A summer course for in-service teachers, with content classes in the morning, and pedagogy classes in the afternoon. Content classes focused on the mathematics of investment and gambling. Co-taught with a very large faculty. A precalculus course at the preservice teacher level, focusing on developing Knowledge of Content and Students through the analysis of student work and classroom video. Students learned to distinguish between powerful meanings of common mathematical terms such as "change," "graph," "proportion," "slope," "average speed," "exponential," "radian," and "sine," and distinguish these meanings and their mathematical consequences from the meanings that students commonly hold. A summer history course for in-service teachers, with content classes in the morning, and pedagogy classes in the afternoon. co-taught with a very large faculty, my portion in the link. A history course primarily for mathematics education majors covering Babylonian mathematics to the development of Calculus. Emphasis was on the study of primary sources and the analysis and identification of the mathematical methods underlying written work. A college algebra course focusing on structured development of quantitative modeling skills. Uses the iterated method to approximate Julia sets and displays the equations for coloring them. Practice drill for running the "I can do Quadratics in my head" routine. Five points determine a conic. A tool for showing how a Bezier Cubic is drawn. Create the equation of a line from point (a,b) and slope m.
Create a line from a point, and the knowledge that every time you go over by Δx, you go up m times as much. A tool for looking at the graphical relationship between A, f(A), and g(f(a)). A graphing tool for making discontinuous or continuous non-exponential solutions to f(x+1)=2f(x), f(0)=1. Drag the red point and keep its x coordinate within [0, 1). A graphing tool for making continuous non-exponential solutions to f(x+1)=2f(x), f(0)=1. Drag the red point to and over the blue x's. A graphing tool for making discontinuous or continuous non-linear solutions to f(x+1)=f(x)+2, f(0)=0. Drag the red point and keep its x coordinate within [0, 1). A graphing tool for making continuous non-linear solutions to f(x+1)=f(x)+2, f(0)=0. Drag the red point to and over the blue x's. A virtual rubberband model for doing multiplication with dilation. A four row caeser cipher slide showing the underlying modular arithmetic. A simple tool for teaching that slope is a constant relationship between all pairs of points on a line. Both points can be manipulated to explore the constant relationship, or a single point can be fixed and the other point manipulated as a tool for deriving formulae. The fingertool parametric plotter with axes set for trigonometric function plotting. The fingertool parametric plotter in four quadrants. A variation of the fingertool parametric plotter with the ability to set the initial coordinates numerically. A 50 iteration cobwebber, with composition, for finding cycles. A simple 26 iteration time series, with fields to change the function and the initial value. Should be sufficient for most uses. A simple 26 iteration cobwebber & time series, with fields to change the function and the initial value. Should be sufficient for most uses. A simple 50 iteration cobwebber, with fields to change the function and the initial value. For those situations where you want just a little more chaos. A simple 25 iteration cobwebber, with fields to change the function and the initial value. Should be sufficient for most uses. A moving showing how to use a rubber band number line to multiply an interval by 2 and multiply an interval by 1/2. 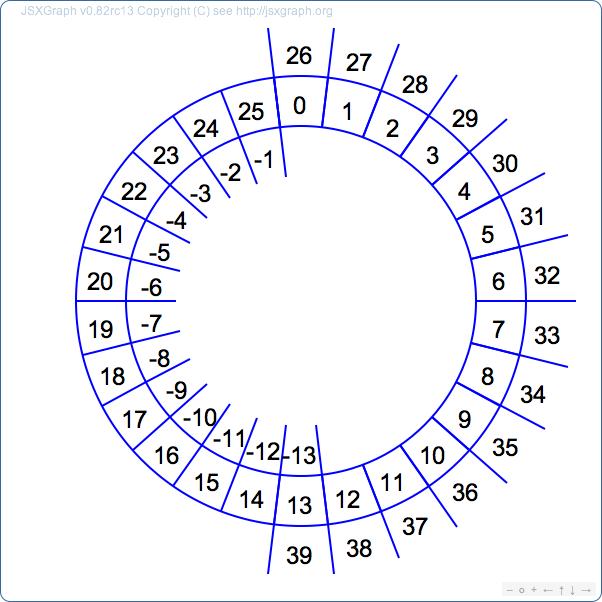 Used to contrast multiplication from repeated addition (addition movie below). A moving showing how to use a rubber band number line to add 2 and add -2 to an interval. Two movies designed to help teachers see the difference between derivative as a limit of a sequence of points and derivative as a limit of sequence of functions. A companion to "Graphing a Derivative" below. A interactive diagram to help students see the "sliding secant" meaning of derivative (Tall 1986; Thompson 1994) as a limit of a sequence of functions. A set of five applets designed to help students learn a continuous image of slope that is more than just rise over run. A buggy (still in development tool) for graphing parametrically on a multi-touch tablet. A worksheet designed to highlight the distinctions between six different modeling assumptions that all lead to exponential growth. Solutions available upon request. A movie designed to be used with supporting discussion to help students think about how to draw the graph of the composition of two functions from their individual graphs.